Dr. Sudhir Goel has obtained his MBBS with one year internship from Seth G.S. Medical College and K.E.M Hospital, Mumbai, India. He later obtained his D.M.R.D (Diploma in Medical Radiodiagnosis) from Patna Medical College, Patna, India. Then in 2011, Dr. Sudhir obtained his D.N.B in Radiodiagnosis and Medical Imaging from Breach Candy Hospital, Mumbai. 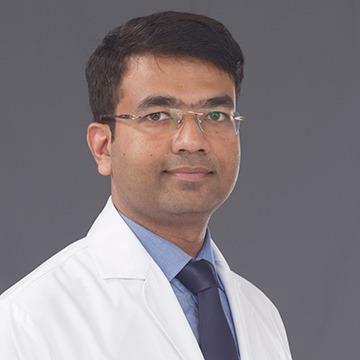 Dr. Sudhir has over 5 years of experience as a Radiologist. He started his professional journey as a Consultant Radiologist at the Global Diagnostics Institute in Yusufsarai, New Delhi. He spent a few months there before joining Rajiv Gandhi Cancer Institute, Delhi as a Clinical Assistant. Dr. Sudhir also worked in Saint Stephen's hospital and G.B. Pant hospital in Delhi before being appointed as Attending Consultant at the Max Balaji Super Specialty Hospital in Patparganj, New Delhi. Then prior to joining NMC Healthcare, Dr. Sudhir spent almost a year as a Consultant Radiologist at the BL Kapoor Hospital in New Delhi. Dr. Sudhir is a Life Member of Indian Radiological and Imaging Association. He has presented paper on “Comparision of Routine and Stress MRI for the Assessment of Spinal Canal Stenosis in Cases of Degenerative Disc Disease” at KCR-2103 in Seoul, Korea. He also presented a paper in European Congress of Radiology (ECR), Vienna in March 2015. Dr. Sudhir has attended many conferences, both national and international. Dr. Sudhir is fluent in English and Hindi.